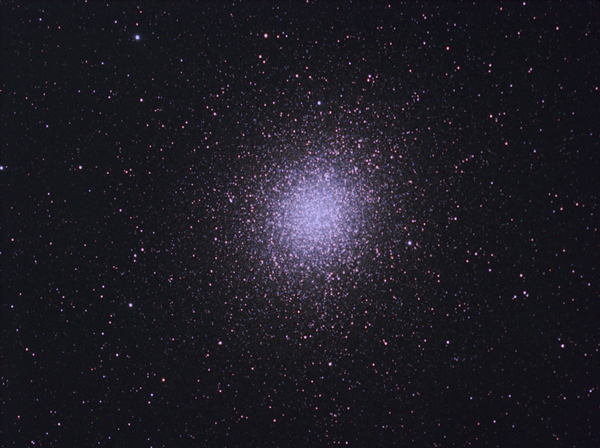 Omega Centauri or NGC 5139 is a globular cluster seen in the constellation of Centaurus. One of the few that can be seen with the naked eye, it is both the brightest and the largest known globular cluster associated with the Milky Way. Omega Centauri is located about 18,300 light-years from Earth and contains ssveral million Population II stars. Reporting in the April 1, 2008 issue of The Astrophysical Journal, astronomers claimed to have found evidence of a intermediate-mass black hole at the center of Omega Centauri. Entirely processed in Images Plus 3.75 by Mike Unsold.